Overwhelmed by hordes of invading nations – and a series of corrupt kings – the fate of Israel is balanced on a knife’s edge! The Northern Kingdom’s only hope is that a band of prophets can cleanse it of evil and idolatry before the wrath of God does so – permanently. 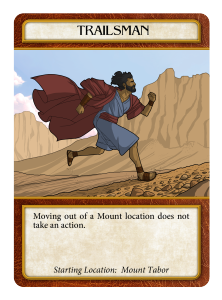 Kings of Israel is a cooperative game that places two to four players in the role of prophets struggling to save their nation from threats both internal and external. Do you have what it takes to overcome the forces of evil? Or will you let Israel succumb to its own destruction? Kings of Israel Box CoverKings of Israel is a board game taking place in Israel (the Northern Kingdom) during the reign of its kings up until Israel’s destruction by Assyria. Players are on a team and each person represents a line of prophets that are trying to remove evil and idols from Israel, while building altars to help guide Israel in the upcoming difficult years. If the players are able to build enough altars before the game ends, they win. If the group runs out of sin cubes or idols, or if the timeline token reaches Assyria destroying Israel, the prophets lose. The game board is a map of Israel with many important locations and nations shown. Between these locations are roads and in addition the cities on the sea are connected by sailing routes. These roads and sailing routes are how the prophets travel around Israel. On the left hand side of the board is a list of all the kings of the Northern Kingdom and this list is also used to keep tract of what rounds in the game. At the beginning of the game a marker starts at the first king, King Saul, and then primarily goes down one space every turn until it hits the bottom, which represents the destruction of Israel by Assyria. During the game evil might appear at each location and idols might also be built. When sin increases at a location with an idol then evil will also expand to all places that are connected to that location by a road. This is the heart of Kings of Israel. 1. King’s Godliness Phase – During this phase, if a bad king is reigning over Israel the players must draw a Sin and Punishment card, which means bad things happen in Israel because of evil or in response to evil. If a good king is reigning over Israel, the starting player instead gets a blessing in the form of a Blessing card. 2. Sin Increases Phase – Location cards are drawn and sin increases at each location drawn. This can possibly cause idols to appear or sin to spread further if sin increases at a location already containing an idol. 3. Prophets Work Phase – In this phase each player gets to use four actions to accomplish their goals. 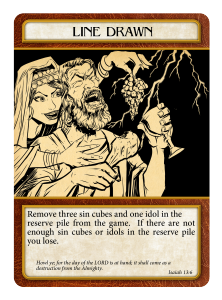 They may use their actions to move, remove sin or idols, draw Resource cards, build an altar, make a sacrifice on an altar, or to give resources to another player. Each player may also play Blessing cards at this time if they have them. 4. End of Round Phase – The starting player changes to the next player clockwise, and the timeline token moves down to the next king chronologically. In the Easy game, any one who has made a sacrifice that turn would draw a Blessing card. And that covers the very basics of Kings of Israel! If you want to get a better idea of how the game plays, I would suggest reading the rulebook found here. There are rules in there for the regular and Bible Study version, with the regular game being more complex, slightly longer to play, and with different three versions to try. Kings of Israel should take about 30 minutes to play for 2 players, 45 minutes for 3 players, and 60 minutes for 4 players, with it being a little longer for the first time a group plays. Add a Review for "Kings of Israel"